REGINA – Rev. 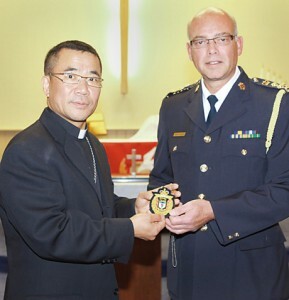 D. J. Kim joined the Regina Police Services as a chaplain Sunday, May 30, in a service at Mount Olive Lutheran Church. Pastor Ted Giese conducted the liturgy, hymns, lessons and prayers, focusing on the servants our Lord has placed among us—police and emergency medical services—to watch over us for our good. Central District president Rev. Tom Prachar preached on Psalm 127:1b, “A Watchman for the City. Following the service Regina’s chief of police Troy Hagen presented Rev. Kim with his badge of office, and Chaplain Blair Dixon addressed the congregation, welcoming Rev. Kim and presenting him with a regulation police hat. Several other police and military chaplains attended the service, as well as members of Regina’s Korean community. Since this was not a formal call from the Central District, Pastor Kim will provide chaplaincy services to the men and women of the Regina Police Service as a volunteer. His experience and contacts may help establish street chaplaincy work in Regina. Rev. Kim also serves as vacancy pastor in the newly established four-point parish of Wolseley, Grenfell, Windthorst and Broadview.